Home/Posts/Brexit, Diversity, Employee Engagement, News/Should you Brexit? Study reveals which European country HR Managers would make the most money in! Imagine if you knew that you could do the same job you love, but make much more money at it, work fewer hours and have longer holidays. This is all easily achievable- you just need to move to a different country! However, this can of course come with the added benefits of better weather, higher standards of living, delicious cuisine… And now there’s a quick and easy way to find out where you should be living according to your career. Credit comparison website Totally Money has created a handy jobs infographic which illustrates how European countries compare to one another, based on salary, average hours worked per week, and paid leave (based on the top 10 countries in Europe that Brits migrate to, including the UK) and it reveals some interesting results. Germany, the economic engine of Europe, ranks as the top country to work in. German workers, living up to their stereotype for being hardworking and efficient (we don’t hear about the superiority of German engineering in car ads for nothing! ), may not boast the highest average salary (that distinction belongs to the Netherlands, in fourth place overall, where people earn on average £39k a year), but they work the fewest hours per week (26), and have one of the lowest living costs. In second place is France, with the highest paid leave (30 days per year), and so it is apparent the republic has a healthy regard for a good work/life balance; they have even suggested a law banning out of hours emails, so called the “right to disconnect”. Whilst it is clear that no countries are equal, neither are job benefits, and the study found that depending on the type of work you do, some countries offer better rewards than others – to explain in its simplest terms, you would far prefer to be a lifeguard in Portugal than in Britain! So where should you work, depending on your job? Totally Money has created a handy interactive tool where you can choose your profession, and compare the pros and cons of working in each country. So if you work in Human Resources you should head for Sweden (with an average salary of over £64k for managers). Electricians will make most money in France (followed by Greece and Spain), and IT consultants should head for Germany (then Greece and Spain). Britain, however, is the best country to work in if you are a train driver, airline pilot or accountant. But what is the overall mood anyway? Are Brits going to up sticks and head to Europe? Or are we happy with what we have? Well, again, this depends on your chosen career. 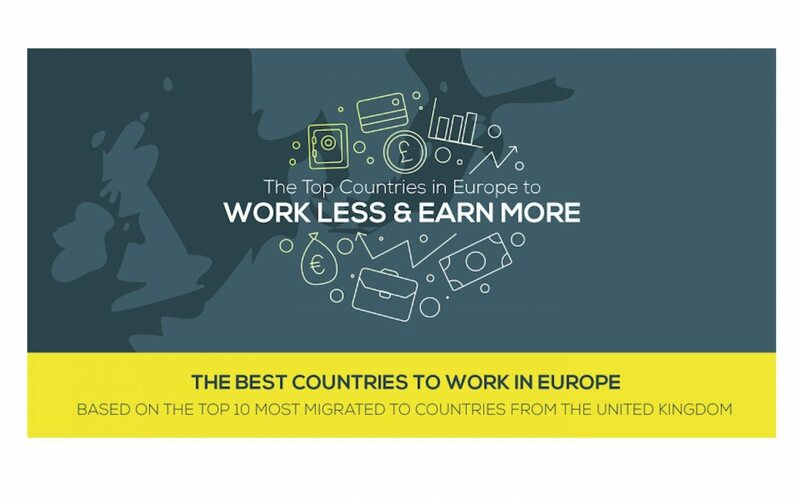 Totally Money also commissioned a survey (1,500 people; via OnePoll) which found that 1/3 of Brits feel over-worked, with 55% also feeling underpaid – and, perhaps as a result, over 55% of Brits have considered moving to a different country. However, leaving family and friends is the biggest worry for Brits when considering moving to a different country.